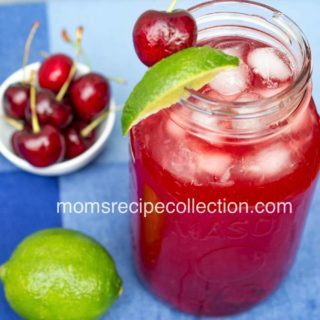 With the 4th of July holiday approaching quickly, it’s time to get those holiday recipes rounded up and ready. 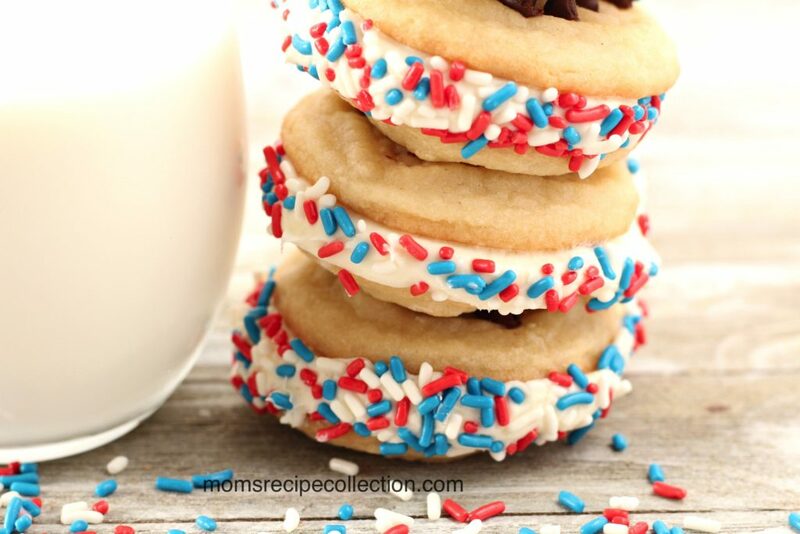 If you love everything fireworks during the 4th of July, these Firecracker Sugar Cookies are a must for your sweet tooth. There are few recipes in the world that I feel are truly fool-proof, but this recipe is one of them. Made with only 4 (yes, 4!) ingredients, this sugar cookie recipe is an absolute breeze from start to finish. 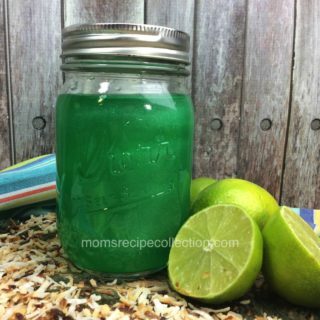 Any recipe that I can make where I don’t have to worry about making a huge mess, I’m ecstatic and ready to give it a try. Rest assured that the only “messy” aspect of this Firecracker Sugar Cookie recipe is the spreading of the icing…and if you get a bit of icing on you while covering the cookie, then that’s a risk that you’ll have to take. If you are planning on attending an outdoor party or bbq over the holiday weekend, these cookies are a must for you to bake and take. 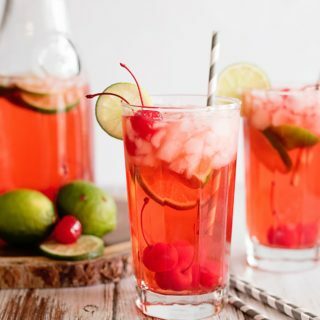 Not only will they be the star of the show, but you should also prepare ahead of time and go ahead and make a double batch of this recipe. They are just that good! 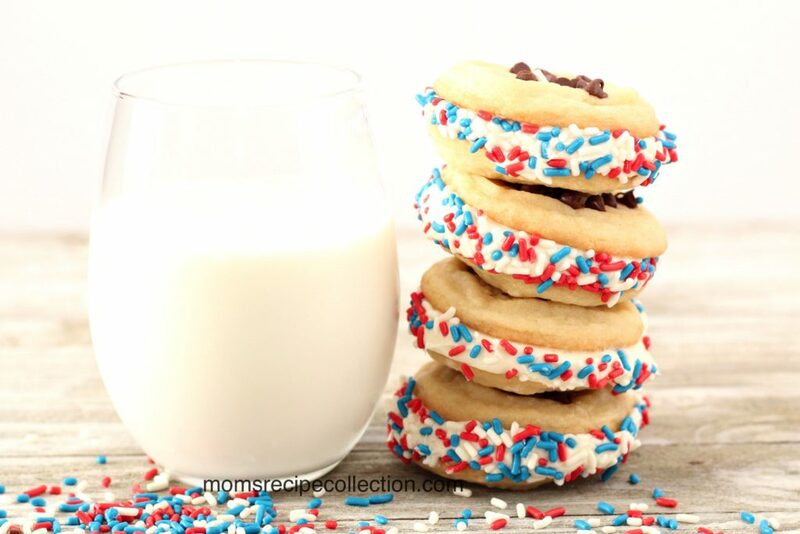 These firecracker sugar cookies are the perfect sweet treat everyone will enjoy at your 4th of July festivities! Preheat oven according to baking instructions on cookie dough. Roll into 1 inch balls (unless pre-cut) and place on baking sheet. Pull from oven and sprinkle mini chocolate chips on the sop of each cookie and gently press into cookie. Bake an additional 2 - 5 minutes, until edges are golden. Place a generous amount of vanilla icing on the bottom side of one cookie, and then sandwich together with another cookie on top. Finally roll the cookie through your sprinkles, making sure to cover all icing with sprinkles.